Senior Graphic Designer & Illustrator Rejane Dal Bello is since 2012 based in London. 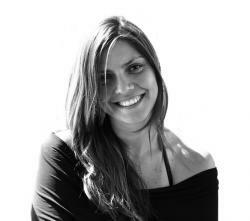 Originally from Rio de Janeiro, she began her career working for renowned branding & design companies in Brazil. After her BA in Graphic Design in Rio de Janeiro, Rejane went on to study under Milton Glaser at the School of Visual Arts in New York City. She completed a MA at Post St Joost Academy in The Netherlands in 2006. During her MA, Rejane joined Studio Dumbar, a graphic design studio that has established a unique position in the Dutch Design scene, where she worked for almost 8 years. Throughout the years Rejane has also been teaching Graphic Design and Creative Process on BA and MA level at St Joost Art school. Rejane is currently a Senior Design at Wolff Olins, a well-known established brand consultancy that specializes in developing brand experiences, creatively-led business strategies, and visual identities.